TUCSON, Ariz. – Scientists and engineers on NASA's Phoenix Mars Mission spent the weekend examining how the icy soil on Mars interacts with the scoop on the lander's robotic arm, while trying different techniques to deliver a sample to one of the instruments. 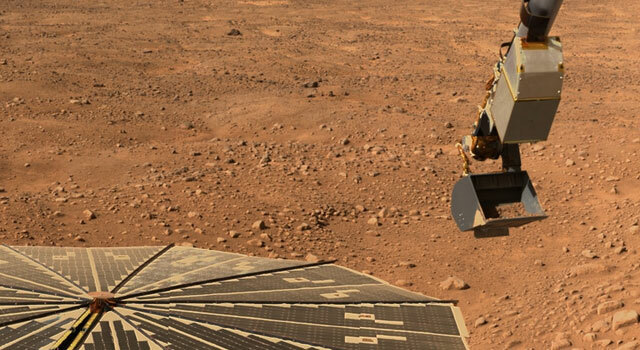 "It has really been a science experiment just learning how to interact with the icy soil on Mars -- how it reacts with the scoop, its stickiness, whether it's better to have it in the shade or the sunlight," said Phoenix Principal Investigator Peter Smith of the University of Arizona. The team tried two methods over the weekend to pick up and deliver a sample of icy soil to a laboratory oven of the Thermal and Evolved-Gas Analyzer (TEGA). In both cases, most of the sample stuck inside the lander's inverted scoop. Images returned early Monday showed a small amount of soil reached the screened opening, but other data indicated that not enough had been funneled into the oven for beginning an analysis of the composition.